Last week I joined What's Cooking Wednesday for the first time and it was so exciting! Now I look forward to spending more time in the kitchen every weekend and I hope to share whatever I'm cooking/ baking there every Wednesday here. So this post is a (not) WORDful (less) Wednesday and What's Cooking Wednesday in one! Lengua de Gato is what these yummy crisp butter cookie wafers are known here. In French, it is referred to as Langues de Chat . 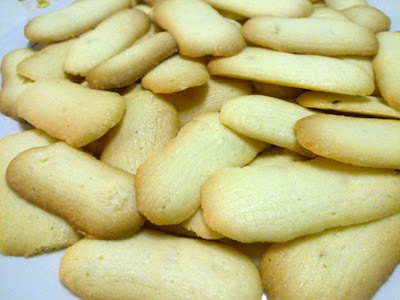 Last week the nephew was playing and found the box of the lengua de gato and came to me saying "Wow! Am...A-am!" He refers all his food as "am" and says "wow" to his favorites. IT Guy the ever sweet and thoughtful asked me if I wanted to go out for a coffee...which was odd because it was already after dinner...but I said yes anyway! Turns out he wanted to buy the nephew some lenguas and after driving around for an hour we gave up. We just couldn't find one! Thus...we decided to bake some Lengua de Gato last weekend. Let me share with you how Lengua de Gatos are done! Very simple...very easy! 2. Add egg white gradually then fold in flour (with salt). 4. Stir until mixture is smooth. 6. Bake in 375 °F oven for 5 to 8 minutes or until light brown. 7. Remove immediately and let cool. Store in tightly covered jars. YUM, Mariposa! These are so wonderful. I think I'll have to make them soon. SO glad you joined WCW! I was thinking of how great they would taste with coffee! We have these cookies in Paraguay and I lovethem!